This painting is a mediaeval representation of Ptolemy I Soter taking Jerusalem in 320 B.C. It is by French artist Jean Fouquet (1420-82). I’m not aware that Ptolemy ever entered Jerusalem; still, it’s nice to see him portrayed here – looking very splendid in his gold armour and fine beard. In this picture we see Thaïs of Athens stand proudly in front of Alexander as she is given the torch that she will use to burn the royal palace in Persepolis. In a very short time the party that is raging all around her and Alexander will be replaced by fire – the scorch marks of which I believe are still visible today. I first saw this picture a few weeks ago; unfortunately, I can’t remember where or, for that matter, who the artist is. 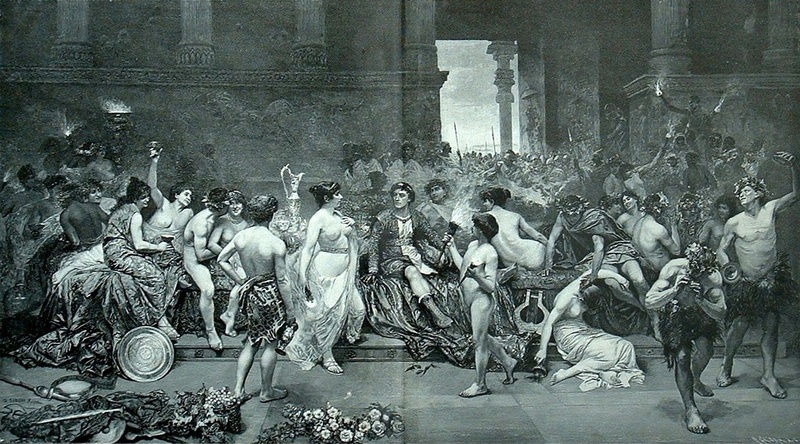 I found the picture again today on a blog titled The Honest Courtesan. The above link takes you to a potted biography of Thaïs by The Honest Courtesan‘s writer, Maggie McNeill. As with all historical studies there are points one can dispute but it is a good précis. One thing it doesn’t mention, which I certainly would have, is Ptolemy’s discretion towards Thaïs, which is indicated by Arrian’s omission of her name in his account of the fire. Having said that, McNeill’s closing paragraph is excellently written and, interestingly, echoes the Venerable Bede’s statement about the bird who lies through the mead hall. 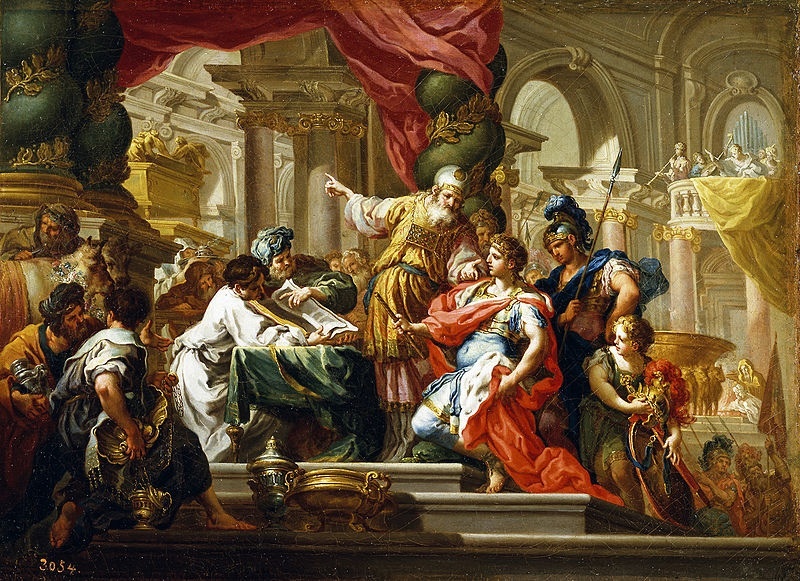 This painting, by Sebastian Conca (16680-1764), is titled Alexander the Great in the Temple of Jerusalem. Ever since I saw it over at Alexander’s Army a while ago I’ve been meaning to write a post about it but couldn’t because I could find nothing out about Conca. As I look at the painting now I am just as struck as I was a few months ago by the twisting pillars. They remind me very much of the pillars in St Peter’s basilica that hold up the baldacchino. Note also St Peter’s arches which reappear in Conca’s painting. To the best of my knowledge, Alexander never visited Jerusalem or had any contact with the Jews. Why might Conca have decided to paint a fictional scene, then? To find the answer to that we would have to know for whom he painted this piece. Whoever it was, I wonder if he was not creating an allegorical scene – Alexander being his patron; the Temple the Catholic Church; Conca is directing his patron to God and obedience to the Church. 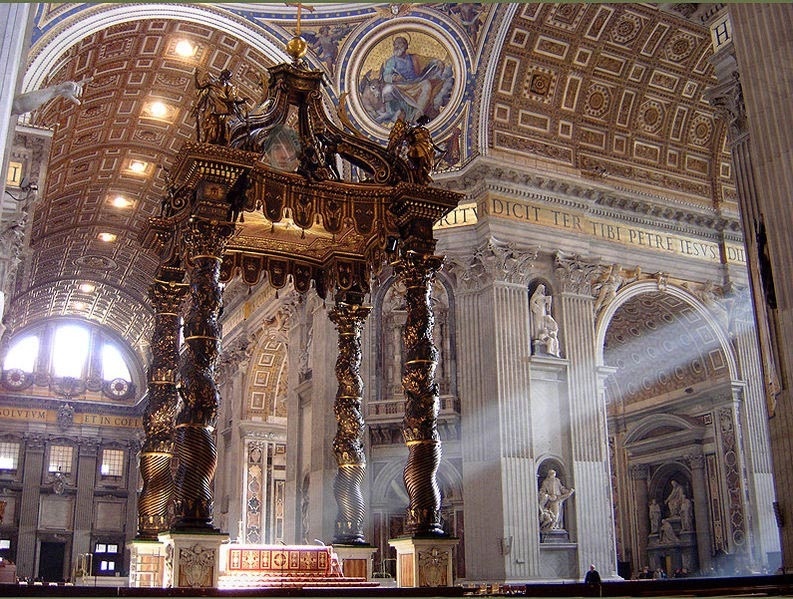 St Peter’s baldacchino was designed by Bernini. 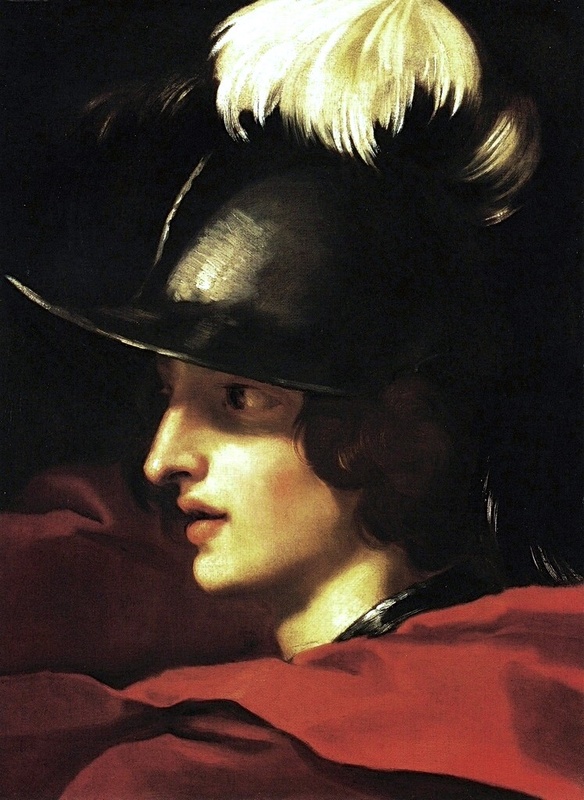 This painting, below, appears on Tumblr where I have seen it described as being a self-portrait of Bernini as Alexander the Great. I have looked around on other websites to see if I can find any proof that Bernini did indeed paint this work but without success. Do you know anything about it? According to our tradition, Alexander dreamed he should sacrifice at our Temple. He was very respectful to the high priest and did not offer any violence while in the holy city. There was no resistance. I wonder who the dead guy was, bleeding on the street,as if Alexander had conquered the place. The holy city resembles a Dutch town, according to the architecture. Jews, G-d, and History says if we had saints, Alexander would have been Saint Alexander. Ptolemy was probably there with Alexander, but afterward, it came under the control of Seleucis, I think, who left control to Antiochus famous for the Chanukah rebellion when he tried to plant a statue of Zeus in the Temple and forbade study of the Torah. Where is this tradition recorded? I don’t know much about the Selukid empire so that’s an interesting bit of information about Antiochus. I found it in Jews, God and History by Max I Dimont. I can’t locate my copy at the moment, so I can’t give the page, but it is on the chapter about Alexander and what followed. I didn’t know why so many Jewish boys were named Alexander (including my uncle) until I read this. Thanks for letting me know that. My library has Dimont’s book so I shall certainly go and check it out. I never saw it before though I am familiar with some other painting on the subject of Alexander visiting Jerusalem (that not included in your post). Records of Alexander “visiting” Jerusalem are coming from Joseph Flavius and some other sources. Ptolemy I renamed at least one city after himself when he became a Pharaoh, the city of Acre (in modern day Israel). It didn’t last for long. I have never seen it before, either. The image is Byzantine but I wonder if it can be called Orthodox as well. There doesn’t appear to be a Christian angle to the painting although I did only took a quick look. I wonder this because I have just blogged a picture of an Orthodox Christian Saint visiting his tomb. Thank you for mentioning Josephus – I was wondering what the original source for the story was. It has been a long time since I read his works. All that I remember is that he was pro-Roman.This makes me think he wrote with a political agenda but I better leave off saying more until I actually read his words. I knew that Ptolemy II (?) founded one or two cities but I don’t recall reading that his dad did so that is also a useful ‘new’ bit of information. If I can find one or two more Alexander-in-Jersualem ((or even Ptolemy) pictures that would make an interesting blog post. 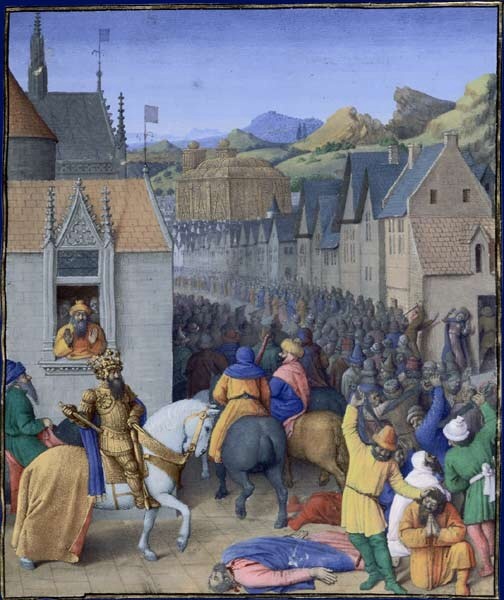 It seems that reports about Alexander in Jerusalem are like buses. You post one and then others start to appear at the same time 🙂 Thank you for the link. A shame about the inaccuracies but let’s hope the researchers can find out more.